I can’t believe it is blueberry season already – boy does that make me happy. Even though you will never find me popping blueberries in my mouth, they are one of my most favorite fruits to bake with. This weekend my cousin was visiting, and after dragging him to Boot Camp Saturday morning, our reward was going to the Farmer’s Market. Before we got there though, I had to stop at my favorite fruit stand. Not only are their prices better than at the Farmer’s Market, they are just so nice, I love supporting their farm. I knew that I wanted to make Blueberry Jam this weekend, and wasn’t sure if I would have enough leftover to make something else. Of course I forgot to mention the Jam to my cousin, so when I walked back to the car with a flat of blueberries, his eyes popped out of his head. It was a similar look when I took him into my pantry to show him my stash…of jam that is. I reminded him about my jam problem, and then it made sense. He immediately offered to hold the blueberries on our way to the market. He couldn’t stop popping them in his mouth, and I could tell my younger daughter in the back seat was getting a little nervous. He offered her a handful, and she said emphatically, “No! You have to stop eating them, my Mommy needs to make jam!” I started laughing – she is definitely the biggest jam lover of the family. As we were walking and eating our way through the market this weekend, we got to the jam stand. My older daughter tried some strawberry jam (that they sell for $8.75) and came running over to me – she told me that my jam is much better. I had already bought her a pastry, so she wasn’t buttering me up for anything…maybe just hoping I would quit my job and stay home to make jam for a living. Fortunately I had plenty of blueberries, and I remembered this recipe I had just looked at in this month’s Bon Appetit. With a name like The Blueberry Blossom Pancake, how could it be anything but beautiful! Wow were these good pancakes. I seriously thought I was at a restaurant. I know I make good pancakes, but these were just incredible. So light and fluffy, with a burst of blueberry in every bite. Oh, and did I mention the streusel on top? Seriously, what is not better with streusel? It added a crunchy texture that really knocked my socks off. So – this weekend, if you are looking for a way to make your family happy – look no further. Waking up to these beauties will definitely make your day blossom. Don’t delay, blueberry season will not last forever! Purée syrup and blue-berries in a blender until smooth; set aside. Preheat oven to 350°. Combine oats, flour, and brown sugar on a small rimmed baking sheet; drizzle with butter and toss to coat. Bake, stirring occasionally, until golden brown, 15–20 minutes. Let cool. DO AHEAD: Streusel can be made 1 week ahead. Store airtight at room temperature. Whisk flour, sugar, baking powder, baking soda, and salt in a large bowl. Whisk egg, buttermilk, and butter in a medium bowl, then whisk into dry ingredients. Heat a large nonstick skillet over medium heat and lightly coat with oil. Working in batches, pour 1/4 cupfuls of batter into skillet and top each with 2 tablespoons berries. Cook pancakes until bottoms are golden brown and bubbles form on top, about 3 minutes. Flip and cook until golden brown and cooked through, about 2 minutes longer. 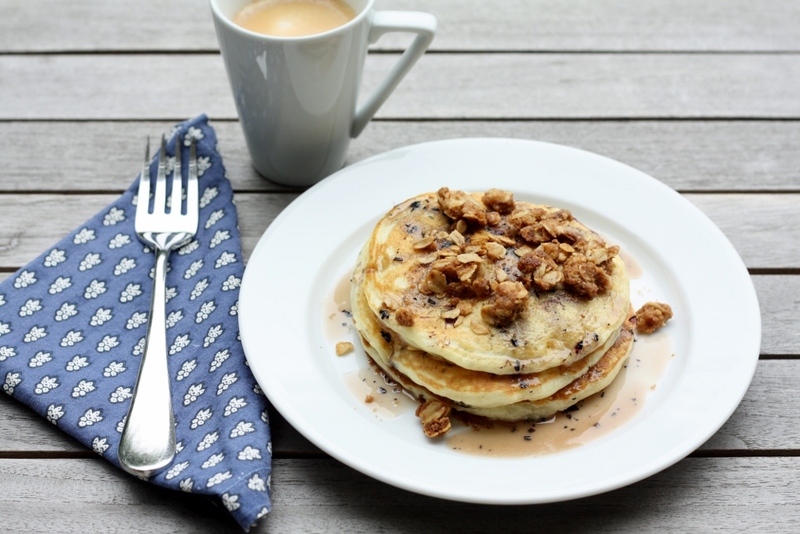 Serve pancakes topped with syrup and streusel. oh my … these look loverly! !